What are the real causes of lower back pain? Is it mostly due to aging and disc problems? While it is true that disc disease and spine arthritis become more common as you age (5) , doctors actually diagnose herniated discs or ruptured discs as a cause of lower back pain infrequently (2). Note: About 3% of lower back pain cases may involve serious medical conditions, including fractures, cancer, aneuryism, and kidney disease* If your pain is severe or constant, please see your doctor for an examination. About 30% of lower back pain cases are given a specific diagnosis such as degenerative disc disease, herniated disc, spinal stenosis or scoliosis. 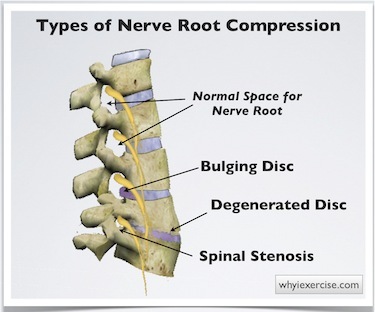 Prolonged pressure on a nerve coming from the spine (nerve root) can trigger pain in many of these cases. 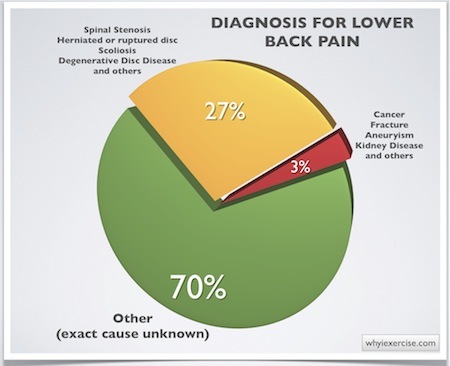 The other 70% of all lower back problems are diagnosed simply as lumbar strain or low back pain (LBP), without giving a specific reason for the pain (7). What then are the causes of lower back pain for most people, this group of 70%? 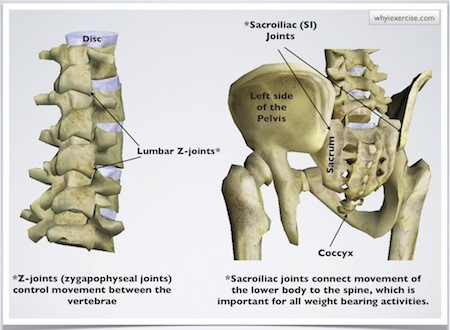 Rehabilitation specialists believe imbalances and poor movement in the sacroiliac (SI) joints and lumbar Z-joints (see below) are 2 of the major factors that lead to lower back pain. 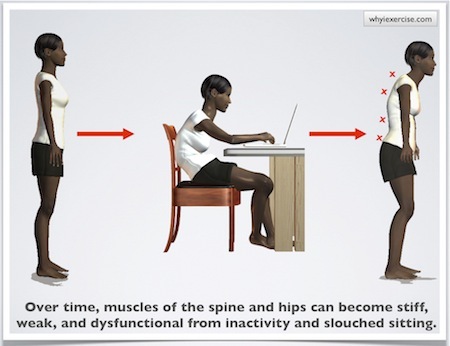 Many people sit for hours in awkward, unbalanced body positions or have jobs that require repetitive movements. Given enough time, these activities can easily lead to stiffness and weakness in the lower back and hip muscles, especially for people who do not exercise regularly. Once these hip and lower back muscles are not functioning normally, back movements and daily activities will become gradually more difficult and uncomfortable, straining the joints of the spine. While it might not be possible to 'undo' severe arthritic changes in the spine, you can make your back feel much better with a new active lifestyle and a back exercise﻿ ﻿program. My most complete reference to date on caring for your back is the eBook, Correct Posture. Has your back been uncomfortable recently? You can start with our exercises for lower back pain: a routine of gentle spine movements and stretches that relieve stress and discomfort in the back. Also see my lower back pain remedy article. It includes ergonomic recommendations for lying down, standing and sitting at your desk. There are exercises to relieve stiffness and you'll also learn the best position to relieve lower back discomfort. The longer term solution: build an active lifestyle from activities you enjoy and include specific back stretching exercises and strengthening exercises into your weekly routine. Return to lower back exercise. Return from causes of lower back pain to home page: Why exercise?